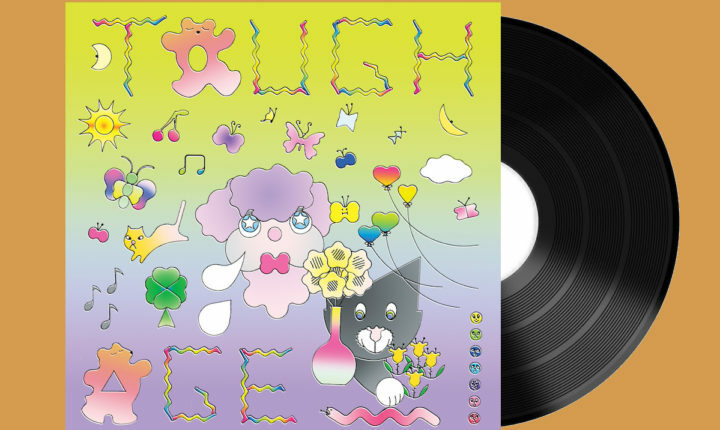 A deeper look at the grooves pressed into the Unclean 7” by Tough Age. After they’ve gone through all three songs which comprise Tough Age’s new Unclean 7”, listeners may find that they need to take a moment and collect themselves – I certainly did. I needed to step back and collect myself because I had no particular desire to just spill ink and compliments all over a page; true, all three songs are great and effortlessly called out the undying fan of independent rock and punk in my soul, but I felt like this release deserves more than just a gibbering stream of compliments. The review needs a foundation because, after having already released a couple of full-length albums and an EP – all of which were pretty good and went well-received with the punk and indie rock crowds – Tough Age has presented listeners with three songs which start fresh from that previous beginning in that it can inspire new, undying adoration for the band in circles outside the punk and indie scenes. That is not to say that Tough Age has spontaneously traded in its indie credibility for a bid at mainstream attention, just that these three songs are so good that they could easily cross over into the pop mainstream, make that mainstream look vapid and pale by comparison, and inspire a grand reset which sees rock re-take the world again. Those statements above are pretty bold, right? Yup. Are any of them an overstatement? Nope. As soon as the stylus on a record player sinks into “Guess Not,” listeners won’t be able to stop themselves from doing an involuntary double-take as Jarrett Samson’s guitar rails out un-effected (that’s “without any effects” – it’s speedy and raucous without any conventional help), backed by Jesse Locke’s tight-and-not-overplayed drums, these things are not new in the strictest sense but instantly exert such a forceful presence that it won’t just inspire instant attention, it commands it – and when Penny Clark jumps in on top with an understated bass part as well as a perfectly garage-y vocal performance, listeners will be hooked. Sure, they’ll they’ll be able to say that they’ve heard stuff like this before, but it has been so long since anything came along that was this good or instantly catchy you might not be able to make out the whole lyric sheet reader, but you’ll bark out “Guess not!” at the end of every stanza – guaranteed) and listeners will want to dive in headfirst and inhabit the song. Not only that, but they’ll have to actively resist the urge to lift the needle after the song ends and restart it immediately; it is only a minute long, after all. After “Guess Not” skids out, those listeners who don’t restart the song immadiately for a second helping will only vaguely notice that the band slows down slightly to continue with “Not That Bad,” but they won’t be able to miss the change in demeanor. Now more methodically paced, Samson begins to scratch at the strings on his guitar as though he wants to tease it while Clark adopts an approach closer to that of Patti Smith circa 1974 (check out her complaints about going nowhere, and her lamentations in lines like “Didn’t want to but it’s already over”) and still coming away with something which sounds fresh, new and pissed off. It’s awesome and the result is that listeners will be rushing to flip the record over so they can hear what’s coming next; in this digital day and age, such dediction is undeniably rare. …And what they find on the B-side of this single can only be characterized as “something else again.” The title track is the only one on the flipside of the single and, playing longer than the sum of the two A-side songs combined, it is a greater departure than anything on the A-side was, previously. This time, Samson steps to the mic and offers up a vocal performance which seems to revive the likes of New Zealand indie stalwarts The Clean, but inadvertently comes closer to sounding like Sonic Youth than anyone (who hasn’t heard it yet) could possibly imagine. Here, the lean and sinewy guitars which sounded so pop-punky on the A-side come through as mathy and repetitive now – which builds some delightful tension – and serves as the ideal foil for Samson’s sighing vocal performance which feels like it’s 100% New York underground-bred in spite of being from Vancouver (and, most recently, Toronto-transplanted). In the end, after the song just sort of chimes out one last time to close out the side, listeners will find themselves scrambling again to just flip and restart the whole experience again so they can get just a little more of the feeling Tough Age has left with them. It’s not like the the last sensation left at the end of the B-side is unsubstantial, just that it sounds and feels so good to makeone’s way through that listeners will want to experience the whole thing again from top to bottom (and maybe “again and again and again”).